As I sit here trying to write this post my two boys are running around making as much noise as humanly possible. That by itself would be mildly irritating, but it doesn't help that they are hyper from eating a healthy dinner. They haven't always eaten so healthy. About two months ago I decided to stop baking sweets and snack multiple times a week and instead provide more fruits, vegetables, and dairy for snacks. So far it has been working very well. It took about a month before the complaints and demands for fast food ceased (for the most part). Along with stopping snacks I have also been changing the types of meat that my family consumes. Instead of ground red meat I now substitute with turkey and chicken. 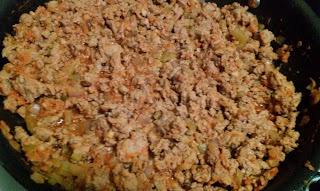 I have been surprised by how much my two boys love ground turkey and I use it frequently. The October 2011 issue of Taste of Home magazine had a recipe for Buffalo Sloppy Joes using ground turkey and promising only 30 minutes of total time. This recipe has 14 ingredients. It takes 30 minutes of total time and makes 8 servings. I had no problems finding any of the ingredients at my local grocery store and made no ingredient modifications. 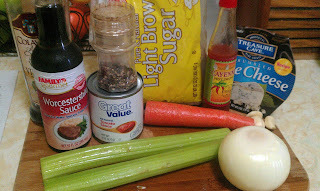 I did use homemade chicken stock, I prefer the flavor to store bought and it is much lower in price. For the hamburger buns I used Sunny Buns, a family favorite. I let the mixture cook down slightly after adding all the ingredients, approximately 5 minutes. If you don't allow the mixture to cook down more it will be a little too watery. I followed the remainder of the recipe as written. I was very surprised by how much my two kids loved the blue cheese in this recipe. I had assumed that they would hate the blue cheese and completely turn up their noses at the whole idea. However, they ate all the leftover cheese out of the fridge after dinner. As for the recipe, it had a great blend of sweet from the hot sauce and brown sugar and is low in fat from the ground turkey. Overall a very quick and child friendly recipe. I was very surprised also, I was like you and couldn't stand blue cheese growing up! This recipe is very easy it literally takes minutes of prep and everything is done in 30 minutes, which is great! I pretty much use turkey burger exclusively. And I'm a big fan of sloppy joes. Another great comfort food! :) Thanks, Frugal! Ooooh Yum, never thought to make them buffalo style! I had never tried them buffalo style either, but the flavor was great! My name is Alex and I work for a specialty produce company called Frieda’s that sells exotic fruits and vegetables to grocery stores all over the country, including SHOP ‘n SAVE in your area. I know you and I have never worked together so I wanted to introduce myself. I came across your blog and wanted to contact you about this new juice that you might be interested in trying that is brand new to Pittsburgh. It’s called MOAB Superfruit Blends™ and we are the exclusive distributor of it. What’s great about this juice (besides being gluten-free, diary-free, and no sugar added) is that it is 100% pure juice. We have 3 flavors, Wild Blueberry (yes, WILD blueberry! ), Pomegranate (my favorite) and Açai, and each juice’s first ingredient is the respective fruit, rather than apple or banana blends and fillers like every other fruit juice on the market. Plus, we give them an extra antioxidant boost by taking the superfruit, concentrating it into a powder, and adding it back into the juice. MOAB is truly nothing like any other juice on the market and only three stores in the whole country have it right now, and SHOP ‘n SAVE is one of them! If this is of any interest to you, please email me at alex.jackson@friedas.com and I'd love to chat!